While the current exhibit in the DAR Museum gallery is being enjoyed by our visitors, preparations for the next exhibit, opening in October, are well underway. ‘An Agreeable Tyrant’: Fashion after the American Revolution will display nearly fifty men’s and women’s ensembles (1780-1826) in over a dozen DAR Museum period rooms on all four floors of Memorial Continental Hall. Costume items are very high-maintenance. Scores of hours of planning go into putting each item on display. This ranges from researching the individual piece’s family history, to doing research to date it more firmly and assess what accessories would complete the look, to doing conservation, to finally dressing the manikins. One of the most serious considerations is condition. We prefer to use things that are exhibit-ready, but some important pieces need a lot of work, like this stylish coat of about 1805 worn by either Charles Carroll, the Signer of the Constitution, or his son. Probably never displayed since its pre-1920 donation due to its unfortunate extensive moth damage (incurred prior to donation), it is at last getting the attention it deserves from a conservator who specializes in men’s wool coats. Colleen Callahan of Costume & Textile Specialists will dye fabric to match the mottled gray color exactly, then back each hole and stitch it almost invisibly. This will take about 30 hours of painstaking, highly skilled work. 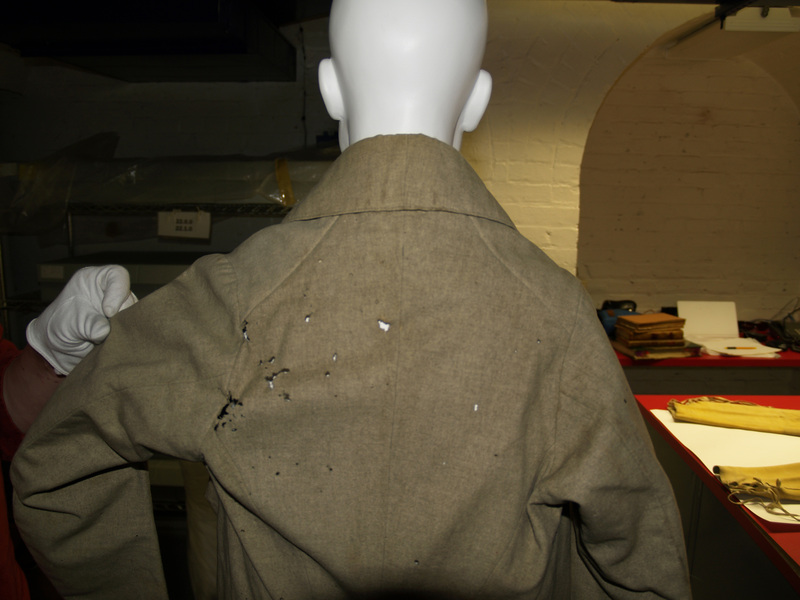 The coat will be not only visibly much improved, but more importantly, structurally sound and fit for display. Over my 25 years at the DAR Museum, we’ve acquired an assortment of modern and historically-styled forms. 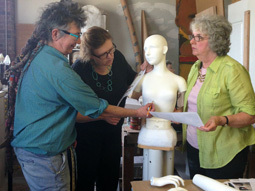 We use and reuse many relatively inexpensive foam torsos (the kind used in retail stores—but realistic forms with heads are much too modern in look and shape for our purposes), which need extensive carving (foam, steak, and bread knives are all useful here) and building up again (quilt batting, tulle, and tissue paper) to give them the right shape and size for period garments. Not only are early garments often more dainty (though they weren’t “shorter back then,” they were generally less athletically built), but corsets lifted and shaped the breasts in radically different ways at various times. At the center of the photo above you can see a foam manikin already carved down, including having hips removed and replaced to mount a snug 1930s dress for our wedding exhibit 12 years ago. The form was reused for one of our “suffragettes” in the New Woman exhibit a few years ago, and will be put into use again for an 1820s gown in this exhibit. For the wedding exhibit of 2004, we had realistic heads added to some of the foam torsos so we could do hair and veils. We’ve used these “cheater” manikins numerous times over the last 12 years. Some of them took a beating, losing their heads. For “Agreeable Tyrant,” we’re fixing our Marie Antoinettes so they can wear dresses fully accessorized with hairstyles and hats. Barbecue skewers and hot glue did the trick. Museum people are the ultimate scavengers, using many odd materials and objects for any given job. Our museum preparator, the ever-creative Leo, created hips for some manikins that end at the waist, from stacks of cardboard disks. Hot glue them together, cut holes in the center for the manikin’s pole, connect to torso with heavy-duty Velcro, and we’ve got a useable manikin with a realistic body! While we will reuse the manikins we have which were designed for historic garments, Empire/Federal era dresses just don’t work on them—they’ll be used for 1780s and 1820s dresses in the exhibit. So to be able to display some of our 1800-1820 gowns accessorized with hairstyle and hats, we have commissioned custom manikins from Lania D’Agostino, who works with the Smithsonian museums and many others. Lania is basing a new manikin on one which is particularly suited to the high, small busts of the Empire/Federal/Regency era. I went to Lania’s Baltimore studio last fall with Colleen Callahan, a curator and conservator we’re working with, and we all brainstormed about what we needed. Costume storage is our staging area. At its best and tidiest it looks like this.For the next couple of months, it will look like this. The manikin is just the first layer: surgical cotton stockinette tubing goes onto each form to give an archival layer over the foam or plaster, then petticoats of the right length, shape (bell-shaped? A line? Straight? ), and bulk. (Bridal petticoats from thrift stores are great for this.) Here is a foam manikin (who luckily managed never to lose her head) with her stockinette camisole, bridal petticoat, and knee-highs-over-quilt-batting-over-wire arms, ready for her 1820s dress. And here is the dress with her embroidered collar and shawl (brooch, “hair,” bonnet and hands still to come). Looking good so far! We think she looks about ready to walk down the aisle as a modern wedding dress, but she’s not done yet. Next she gets the 1780s brown silk damask dress and a narrow embroidered muslin shawl criss-crossed over the bosom. The shawl has since been carefully wet-cleaned to remove some of the yellowness (which indicates acidity which is bad for the cotton; it’s not done purely for aesthetics). Next, we will add a wide silk vintage ribbon as a sash and some reproduction sleeve ruffles to make our 1780s lady rock an early 1790s updated look. Accessorizing each garment takes a lot of thought. 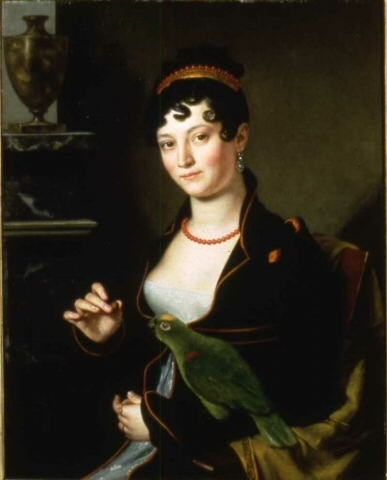 We look at portraits, fashion plates, and any other visual sources we can find, and see what we have in the collection, or can borrow, to complete the look. This elegant portrait, currently displayed in the Ohio Room, will inspire our choice of some reproduction jewelry, to accessorize one of our white muslin gowns. Some accessories need to be made as reproductions, including several slips to go under sheer muslin; men’s and women’s linen dickeys and chemisettes; and a pair of gentlemen’s evening breeches. For these, we have a very unpleasant duty: fabric shopping (it’s rough, but someone’s gotta do it!). While in New York City last month, I went to Mood Fabrics—you may have heard of it if you watch Project Runway!—to find the right kind of cashmere for our evening breeches to be worn by the manikin we’ve nicknamed “Mr. Darcy.” The selection was outstanding. It was fabric heaven! Fortunately, many accessories are taken from period garments in the Museum’s collection. We’ll be using many period shoes, stockings, purses, fans, and hats. For this silk “pelisse” (coat), on loan from a private collection, we are spoiled for choice, and can go with either of two c. 1820 bonnets: a fine Leghorn straw with its original silk plaid ribbon ties, or a real beaver fur bonnet (as opposed to the more commonly found woven silk plush simulating beaver), which will need some vintage or modern ribbon purchased to create ties; we can use one of our 1820s hat veils for trim. . The pelisse is lightweight, and could go with a spring straw or a fall/winter fur. Which would you go with? Which will we pick? You’ll have to come to see the exhibit when it opens in October to find out!